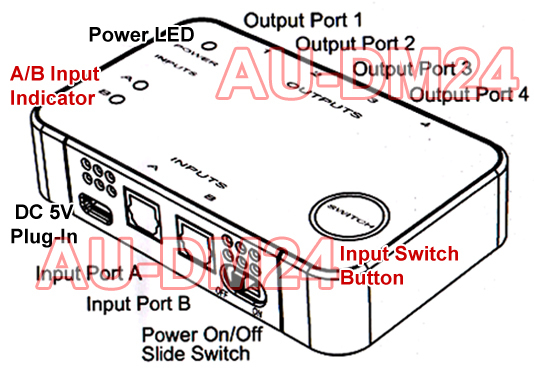 This optical audio splitter is designed for the digital audio distribution and amplification from any one of the 2 digital inputs to 4 identical optical audio outputs for hookup with multiple receiving devices such as sound bar, Blue-ray DVD player, audio recorder, game console, audio receivers, home theater systems and all other digital audio devices. This digital audio distributor not only duplicates but also boosts the digital audio input signals for longer distance with original sonic quality retained over the long cable run, making this optical audio splitter an excellent choice for home theater setup and professional audio distribution. This digital audio splitter supports all S/PDIF digital audio transmission for uncompressed PCM/LPCM and bitstream Dolby 5.1, Dolby Digital, DTS, AC-3. This active powered optical audio splitter is designed to deliver the supreme performance required by the top standards of digital audio production. Its active signal splitting has numerous benefits over using those non-powered passive style audio splitters. Its active design with external power supply doubles the amount of light on each output compared with traditional passive splitters. Each output port provides full digital audio signal level same as the original input feed and can be transmitted over long distance without signal degradation. This unit supports a broad range of digital audio sampling rates at 32, 44.1, 48 and up to 96 kHz maximum. With 4 independent transmitters built in this digital audio splitter, all 4 digital audio outputs from this audio splitter have the same crystal clear sonic quality as the original optical input. No signal loss and no noise for best performance. 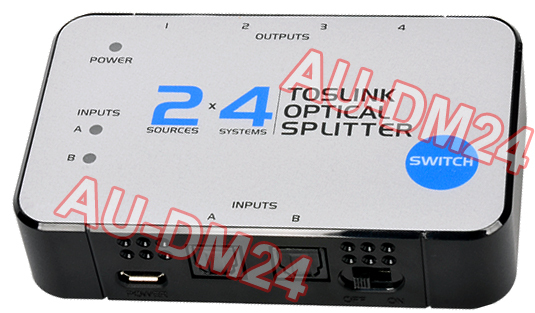 This optical audio splitter can also be used as the repeater to achieve longer cable run without any problem. Its repeater function can double the maximum transmission distance of an optical connection from the normal range of 15-30 feet to 30-60ft, depending on the cabling and equipment used. Active digital audio splitter with external power supply for true bit-transparent and lossless duplication of digital S/PDIF audio signals. Premium digital audio distribution splitter amplifier with 2 optical audio inputs and 4 simultaneous optical audio outputs. Supports broad range of digital audio sampling rates at 32kHz, 44.1kHz, 48kHz, 96 kHz. Support audio repeater function to double the transmission distance from the normal range of 15-30 feet to 30-60ft, depending on the cabling and equipment used. Compatible with all digital audio formats such as SPDIF, AC-3, etc. Supports all S/PDIF digital audio transmission for uncompressed PCM/LPCM and bit-stream type of Dolby Digital, Dolby 5.1, AC-3, DTS. Supports daisy chaining multiple audio splitter units together to achieve more digital audio distribution and longer cable run for large-scale digital audio broadcasting and presentation setup as needed. Send the digital S/PDIF audio in optical format from TV or blu-ray player to 4 audio receivers, sound bars, amp, home theater system or speakers. DC 5V power adapter included.